We all know the impact of all wars in communication. The new exhibition we would like to highlight is hosted in the wonderful venue of Villa Manin in Passariano, Udine. 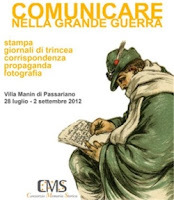 It is a kind of journey through the different types of communications: magazines, trench newpapers, the huge flood of correspondence from the front, propaganda and war photography are the main themes that the curators of Consorzio Memoria Storica developed. And if you plan a visit, don't forget to check the website of Villa Manin, where interesting and well curated art exhibitions are often hosted.